This single-centre, randomised, crossover study used a short-term in situ dental erosion remineralisation model to explore the remineralisation of acid-softened enamel in the 4-h period immediately following brushing with an anti-erosion, dentin hypersensitivity test dentifrice containing 1150 ppm fluoride (as sodium fluoride [NaF]) or a placebo dentifrice with no fluoride. Fifty participants wearing a palatal appliance holding surface-softened bovine enamel specimens brushed their natural teeth with their assigned dentifrice. Specimens were removed at 5-, 10-, 15-, 30-, 60-, 120- and 240-min post brushing. Enamel remineralisation effect was evaluated at each timepoint by percent surface microhardness recovery (%SMHR) and enamel fluoride uptake (EFU). After a second in vitro erosive challenge, the percent relative erosion resistance (%RER) was calculated. Statistically significant differences in %SMHR were observed for the test dentifrice compared with the placebo dentifrice from the 60-min timepoint onwards (all p < 0.02; mean difference of 8.66 [95% CI 3.46, 13.87] at 60 min). At each specimen removal time, %RER and EFU were statistically significantly higher for the test dentifrice compared with the placebo dentifrice (p < 0.0001 for all). No treatment-related or serious adverse events were reported. The NaF-containing anti-erosion, dentin hypersensitivity dentifrice improved remineralisation of acid-softened enamel starting at 60 min of intra-oral exposure. It also improved enamel erosion resistance and fluoride uptake as early as 5 min after exposure to fluoridated dentifrice slurry. Brushing with a NaF-containing dentifrice can rapidly improve remineralisation, enamel erosion resistance and fluoride uptake. Early dental erosion lesions are characterised by dissolution of the hydroxyapatite component of enamel, leading to demineralisation of the tooth surface and formation of a softened enamel surface zone [1, 2]. At this stage, as the mineral and organic scaffold remains, the enamel surface can be repaired through remineralisation. However, if frequent or aggressive demineralisation continues, wear of the softened enamel surface can occur and irreversible bulk tissue loss may be observed . The action of saliva on the softening and rehardening of tooth enamel was first reported in 1912 . Since then, the dynamic nature of demineralisation–remineralisation at the enamel surface in the oral environment has been studied extensively . It is now generally established that calcium and phosphate, super-saturated in saliva, are deposited on the softened enamel surface during remineralisation, replacing the mineral structure lost during enamel dissolution and subsequently rehardening the surface [6, 7]. Treatment of dental erosion generally involves the use of fluoride that, when applied topically from a dentifrice, can reduce the rate of demineralisation and accelerate the tooth’s natural remineralisation process [8, 9, 10, 11]. There is substantial evidence that fluoride encourages remineralisation by adsorbing to enamel to form a fluoridated mineral lower in solubility than the original enamel. Fluoride will also be retained in oral reservoirs (e.g. plaque, saliva and soft tissue) and released over several hours, promoting remineralisation [8, 9, 10]. The net result is that the tooth surface becomes harder and more resistant to subsequent acid attack [12, 13, 14]. Duckworth and Morgan  reported that fluoride concentration in the oral environment following application is biphasic in nature. Salivary fluoride concentrations shortly after brushing are dominated by loosely adhered paste/paste slurry that is rapidly (< 30 min) cleared from the oral cavity through swallowing, with desorption from fluoride bound to the oral (soft) tissues accounting for the presence of longer term salivary fluoride. Feagin et al. investigated the reaction kinetics of calcium and phosphate in vitro and reported that fluoride exerted an enhancement of the rate of reactions on surface enamel shortly after application. Studies using in situ models, particularly those employing surface microhardness (SMH), have shown that fluoride in saliva can reharden acid-softened enamel and provide resistance toward further demineralisation to a greater extent than a non-fluoride control [8, 9, 10, 17, 18]. Moreover, the protection and remineralisation afforded by fluoride has been observed as early as 2 h after application . The remineralisation potential of fluoride and subsequent resistance toward further demineralisation immediately post-brushing has not been investigated clinically and may help provide information on the relative benefit afforded by fluoride following initial application from that retained in the oral fluoride reservoirs. The primary objective of this exploratory study was to use an experimental in situ erosion–remineralisation model to evaluate and compare the effect of fluoride on enamel remineralisation in the period immediately and up to 4 h after brushing with a test dentifrice containing 1150 ppm fluoride as sodium fluoride (NaF) or a matched placebo dentifrice without fluoride. This was a randomised, single-blind (with respect to the laboratory analyst), crossover study conducted at a USA-based research facility. The protocol was approved by the Indiana University Institutional Review Board [IRB#1410627001] and the study conducted in accordance with the Declaration of Helsinki, the International Conference on Harmonization of Technical Requirements for Registration of Pharmaceuticals for Human Use and local laws and regulations. All participants provided written informed consent prior to screening. There was one administrative amendment to the protocol, which did not affect study flow or outcomes. Participants previously accepted into the research facility’s appliance panel (IRB# 1306011538) and for whom a palatal appliance had already been constructed were screened for this study. All participants were from the Indianapolis area where community water contains approximately 1 μg/mL fluoride. Healthy participants aged ≥ 18 years were eligible for inclusion if they had unstimulated and gum-based stimulated salivary flow rates of at least 0.2 and 0.8 mL/min, respectively; a maxillary dental arch suitable for retention of the palatal appliance; and a confirmed palatal appliance fit at the screening visit. Exclusion criteria included a medical or dental condition that could pose any unwarranted risk in administration of the study products to the participant or affect the participant’s ability to understand or follow study procedures or requirements; any sign of grossly carious active lesions, moderate or severe periodontal conditions, or severe tooth wear; an intolerance or hypersensitivity to the study materials; use of any investigational products or participation in another clinical trial within 30 days of the screening visit; pregnancy; or breastfeeding. For the duration of the study, participants were not permitted to use products with additional sources of fluoride (e.g. fluoride mouthwashes, gels, fluoridated dental floss, gum/lozenges, tablets or drops) except those occurring naturally in their diet. This study used a modified experimental version of the in situ erosion–remineralisation model developed by Zero et al. . As described in full elsewhere, enamel blocks (5 × 5 × 3 mm) from bovine teeth were ground and polished to provide a flat surface for microhardness measurements . As a final cleaning step, the polished blocks were sonicated and rinsed in deionised water. Specimens were rejected if they had white spots, or any cracks or other defects. The enamel specimens were exposed to an acidic challenge by immersion in commercially available grapefruit juice (Kroger frozen grapefruit juice concentrate, Kroger, USA; 35 mL/specimen; pH 3.17 ± 0.10; 171.9 mmol/l of 0.1 N NaOH to reach pH 7.0) for 25 min. Following sterilisation with ethylene oxide gas, the demineralised enamel blocks were then fixed to a tailored intra-oral palatal appliance engineered to hold eight specimens mounted on two plastic holders. The palatal appliance was inserted into the participant’s mouth and exposed to the test or placebo dentifrice. After the appliance was removed at each timepoint, the enamel specimens were subjected to a second demineralisation treatment identical to the pre-treatment procedure . At the screening visit, participants underwent an oral soft tissue (OST) and oral hard tissue examination. An OST examination was also performed before and after each treatment visit. Participants were provided with a fluoride-free dentifrice containing 5% w/w potassium nitrate (KNO3). During the washout period, participants were required to use their own toothpaste for at least 1 day and then the non-fluoride dentifrice provided for the 2 days prior to each treatment visit. At the baseline visit, eligible participants were randomised to one of two treatment groups according to a computer-generated randomisation schedule provided by the Biostatistics Department of the study sponsor. The study treatments were as follows: (i) a dentifrice containing 1150 ppm fluoride as NaF (US Sensodyne Pronamel – Mint Essence; GSK Consumer Healthcare, Weybridge, UK) (test) and (ii) a placebo dentifrice without fluoride (placebo). Both dentifrices contained 5% w/w KNO3. Each participant completed both treatments in random order, one at each of the two treatment visits. To ensure that the laboratory analysts remained blinded to treatment allocation, the study dentifrices were supplied in over-wrapped tubes and laboratory staff did not have access to clinical study records or test products. The products differed slightly by taste so while the participants were blinded to treatment allocation and product (due to over-wrapping), differences could be ascertained. Participants were instructed not to use any dentifrice and other fluoride-containing products on the morning of each treatment period and not to eat or drink (except water) for at least 30 min before the treatment period. At the treatment visit, each participant inserted their palatal appliance for 5 min prior to treatment. The clinical personnel provided each participant with a toothbrush loaded with 1.5 g of the assigned dentifrice. They instructed participants to brush only the buccal surfaces of their teeth for 25 s to create a dentifrice slurry, then swish the slurry around the palatal appliance for 1 timed minute to permit direct contact with the enamel specimens. Participants expectorated the slurry, then gently rinsed with 15 mL of deionised water for 10 s and expectorated the rinse. Participants were instructed to not eat during the entire 4 h of each treatment period, to not drink water for the first 2 h of the test period and to refrain from talking for the first hour when wearing their appliance during the test period. The palatal appliance was removed at 5-, 10-, 15-, 30-, 60-, 120- and 240-min post treatment (timed from completion of the water rinse). One enamel specimen was randomly removed at each timepoint; at 240 min, the remaining two specimens were removed. The same procedure was repeated for the second treatment after the washout period, only changing the dentifrice provided to the participant. Changes in the mineral content of the enamel specimens were evaluated using the SMH test [8, 10, 19]. This model assesses how an equivalent force applied to an enamel surface may produce varying indentation lengths in the enamel under different conditions, with smaller lengths indicating greater microhardness. Prior to the first erosive challenge, five indentations 100 μm apart were made in the centre of each enamel specimen using a Knoop diamond placed under a 50-g load for 11 s (2100 HT; Wilson Instruments). Indentation lengths were measured and the mean indent length was calculated (B). Indentation lengths were also calculated after the first in vitro erosive challenge (E1), after the in situ remineralisation test (R) and again after the second in vitro erosive challenge (E2). Acceptability criteria for specimen inclusion were mean indentation length at baseline of 43 ± 3 μm and an increase of 10–20 μm after the first erosion challenge. The extent of remineralisation was calculated as the percent SMH recovery (%SMHR), based on the method of Gelhard et al. : %SMHR = [(E1-R)/(E1-B)] × 100. The %SMHR was determined for each specimen at each timepoint. For specimens assigned to the 240-min remineralisation time, the mean value was calculated and considered for statistical analysis. Enamel resistance to a post-remineralisation erosive challenge was calculated as the percent relative erosion resistance (%RER) according to the formula: %RER = [(E1-E2)/(E1-B)] × 100 . The %RER was determined for each specimen at each timepoint. For specimens assigned to the 240-min remineralisation time, the mean value was calculated and considered for statistical analysis. Enamel fluoride uptake (EFU) was determined using the microdrill enamel biopsy technique after %SMHR assessment and before %RER assessment . Each enamel specimen was mounted perpendicular to the long axis of a drill bit attached to a specially designed microdrill and drilled to a depth of ~ 100 μm through the entire lesion (four cores per specimen). The amount of fluoride uptake by enamel was calculated based on the amount of fluoride divided by the area of the enamel cores. Adverse events (AEs) and any abnormalities in the OST examination were recorded from the start of the study period until 5 days after the last administration of study product. Clinical judgement was exercised by the investigator to assess the relationship between the study product and the occurrence of each AE, with intensity graded as mild, moderate or severe. This study recruited 50 participants to ensure approximately 44 participants completed the two treatment periods. A sample size of 44 participants was calculated to have approximately 90% power to detect a between-treatment difference in %RER of approximately 11.5% (with estimated variability of 268.34) and a between-treatment difference in %SMHR of approximately 8% (with estimated variability of 127.39) based on two replicates. The actual estimates of variability (residual mean square error from the analysis of covariance [ANCOVA] model) for %RER and %SMHR across the 4-h assessment period were 508 and 193, respectively. This was an exploratory study. To consider the study results valid, the between-treatment difference in %RER at 240 min was required to be statistically significant (p < 0.05) in favour of the test dentifrice containing 1150 ppm fluoride. The %RER and %SMHR were evaluated by time using an ANCOVA model with fixed effects of treatment and study period and a random effect of participant. Baseline and pre-treatment acid challenge values were included as covariates. An exploratory analysis was also conducted to look at the effect of time. This was achieved using a repeated measures ANCOVA. The analyses included fixed effects of treatment, study period, time of extraction and a time by treatment interaction and a random effect of participant. Baseline and pre-treatment acid challenge values were included as covariates. In all cases, corresponding 95% confidence intervals (CI) and differences between least square means are presented. EFU was evaluated by time primarily using an analysis of variance (ANOVA) model with treatment and study periods as fixed effects and participant as random effect. Treatment comparisons were derived from the ANOVA model for EFU and corresponding 95% CI and least square means for treatment differences are presented. Correlations between EFU, %RER and %SMHR were examined by treatment group over all extraction timepoints using graphical techniques. Pearson’s correlation coefficients were calculated between EFU, %RER and %SMHR by treatment and timepoint, over all timepoints and by combined treatments. The per-protocol (PP) population, defined as all participants who fully complied with all study procedures and restrictions, was the primary population for the efficacy analysis. The safety population included all randomised participants that were dispensed in the study treatment. The intent-to-treat (ITT) population included all participants who received at least one dose of study medication and had at least one post-baseline efficacy assessment. The first participant was enrolled on 12 December 2014 and the last completed the study on 29 January 2015. Of the 59 participants screened, five did not meet the study criteria, two withdrew consent and two were not randomised for unstated reasons. A total of 50 were randomised to treatment and 50 completed the study. Participants had a mean age of 42.3 years (SD ± 10.24); the majority were female (n = 33; 66%) and were white (n = 40; 64%) or black/African American (n = 15; 28%). 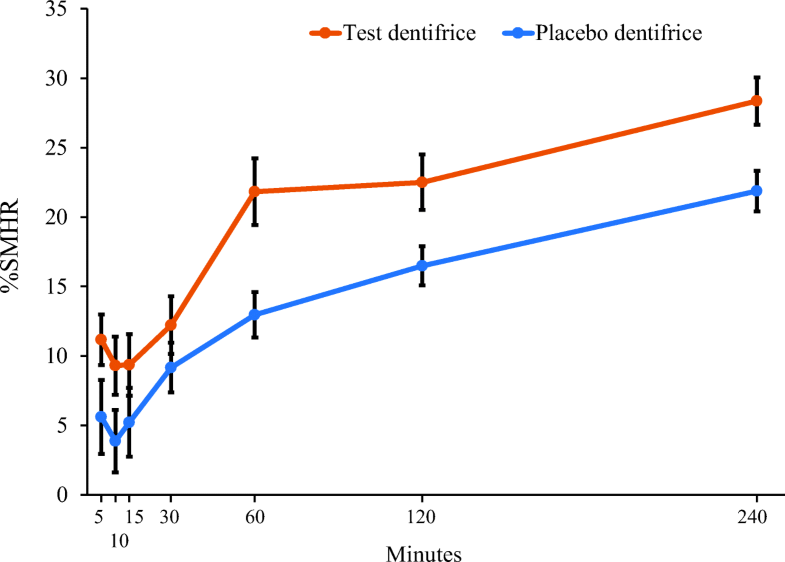 At the 5- to 30-min specimen removal times, %SMHR was numerically higher for the test dentifrice compared with the placebo dentifrice; however, there was no statistically significant differences between them. 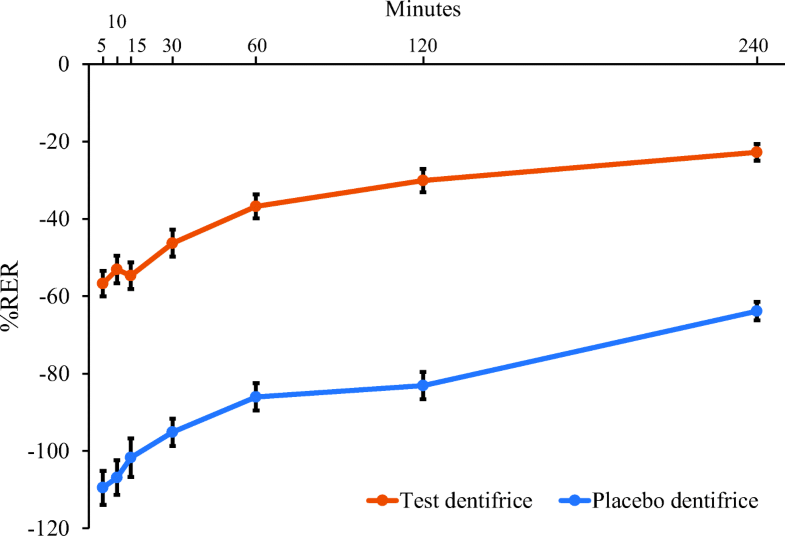 At 60, 120 and 240 min, %SMHR was statistically significantly higher for the test dentifrice versus the placebo dentifrice (Table 1; Fig. 1) (p < 0.05 for all). Averaged across the 4-h assessment period, the mean %SMHR was 5.68 units higher in the test dentifrice group compared with the placebo dentifrice group (95% CI 3.60, 7.76; p < 0.0001). The main effect of time was statistically significant, indicating that in both groups the %SMHR changed across the 4-h assessment period (p < 0.0001). The treatment by time interaction was not statistically significant, indicating that the %SMHR changed in the same way in both groups over time. EFU was statistically significantly higher in the test dentifrice group compared with the placebo dentifrice group at each timepoint (Table 1; Fig. 2) (p < 0.001 for all). Averaged across the 4-h assessment period, the mean EFU was 0.90 μg F/cm2 higher in the test dentifrice group compared with the placebo dentifrice group (95% CI 0.83, 0.96; p < 0.0001). The main effect of time and the treatment by time interaction were not statistically significant, indicating that the EFU values did not significantly change across the 4-h assessment period and between the groups. At each specimen removal time, %RER was statistically significantly higher for the test dentifrice compared to the placebo dentifrice (Table 1; Fig. 3) (p < 0.0001). 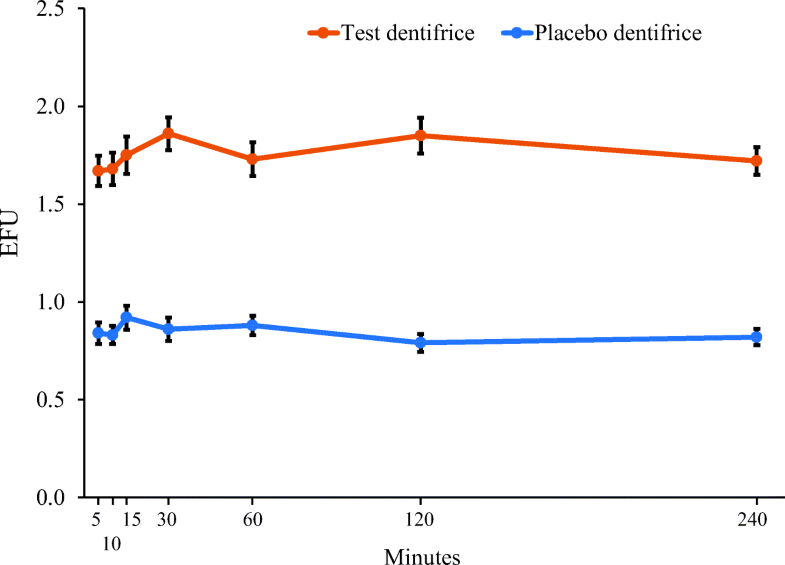 Averaged across the 4-h assessment period, the %RER was 48.32 units higher in the test dentifrice group than in the placebo dentifrice group (95% CI 44.94, 51.70; p < 0.0001). The main effect of time was statistically significant (p < 0.0001), indicating that in both groups, the %RER changed across the 4-h assessment period. The treatment by time interaction was not statistically significant, indicating that the %RER changed in the same way in both groups over time. When the data were collapsed across both dentifrice groups, there was evidence of positive correlations at each specimen removal time between %RER and %SMHR (correlation coefficient ranging from 0.35 to 0.53) (Table 2, column 3) and between %RER and EFU (correlation coefficient ranging from 0.37 to 0.65) (Table 2, column 4). There was no consistent correlation between %SMHR and EFU (Table 2, column 2). When each dentifrice was considered separately, a correlation was evident between %RER and %SMHR (Table 2, columns 6 and 9); however, this was not as strong as when the dentifrices were evaluated together. The correlation between %RER and EFU was less evident (Table 2, columns 7 and 10). There were five treatment-emergent AEs in the test dentifrice group (four of which were oral), reported by four participants. In the placebo dentifrice group, there were six treatment-emergent AEs (two of which were oral) reported by five participants. No AEs were considered to be related to treatment and no serious AEs occurred. Fluoride can enhance the rate of mineral deposition, and thereby enamel surface rehardening, by the formation of various fluoridated calcium phosphate minerals [8, 9, 10, 11]. Moreover, the fluoridated minerals have been shown to reduce the rate of enamel surface dissolution [22, 23] and confer protection against subsequent acid challenges [12, 13, 14]. While this has been shown in a number of in vitro and in situ erosion models [7, 8, 10, 17, 18, 24, 25, 26, 27], no in situ study to date has investigated the remineralisation of erosive lesions over time, specifically at very early timepoints after brushing. This study explored the time-dependent nature of enamel rehardening and subsequent protection against an acid challenge by fluoride in the oral environment using an in situ erosion model. The value of this model has been demonstrated in several clinical trials that have reported the effectiveness of fluoride dentifrices to reharden enamel previously softened by erosive challenge following a single brushing and 4 or 8 h in situ. These trials concluded that short-term in situ experimental models are sensitive, reproducible and biologically relevant [8, 9, 10, 17, 18]. The study described herein employed the design of Zero et al. , but was modified to permit samples to be collected at earlier timepoints of 5-, 10-, 15-, 30-, 60- and 120-min post brushing, in addition to the standard 4-h timepoint. 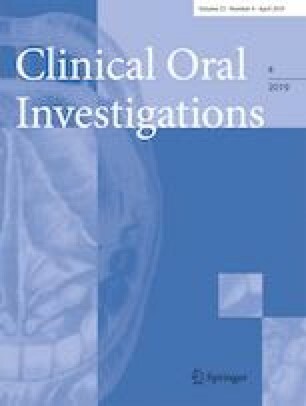 In agreement with previous studies [9, 10], the fluoride dentifrice employed in this study demonstrated significantly greater resistance to an erosive challenge (%RER) and significantly greater surface microhardness recovery (%SMHR) compared with the placebo dentifrice at the 4-h timepoint. As such, the study was considered valid to permit evaluation at all further timepoints. The fluoride dentifrice was significantly more effective than the placebo dentifrice in terms of %RER at all timepoints. For %SMHR, there were directional trends in favour of the fluoride dentifrice observed at all timepoints, with statistically significant differences from the 60 min of intra-oral exposure timepoint onwards. These data clearly demonstrate that fluoride acts to enhance the intrinsic rehardening properties of saliva and inhibit demineralisation of acid-softened enamel within 60 min of application, with significant differences in %RER seen as early as 5 min. While significant differences were observed in favour of the fluoride treatment, it is interesting that analysis of the treatment-by-time interaction demonstrated that both %RER and %SMHR behaved similarly for both treatment groups over the time period investigated, albeit offset at all timepoints in favour of the fluoride dentifrice. This observation may suggest that, in this model, fluoride primarily acts to enhance the remineralisation conferred by saliva by the fast formation of insoluble calcium fluoride deposits and the subsequent effect of fluoride incorporated into enamel driving further remineralisation. Fluoride pharmacokinetics following application from fluoride toothpastes have been well characterised, for example by Duckworth and Morgan  and Zero et al. [28, 29]. Most of the fluoride is cleared from the mouth immediately after application. Concentrations then fall rapidly for 30 to 60 min because ‘loosely bound’ fluoride is leached from the oral fluoride reservoirs, reaching a relatively stable value after 2–3 h. In this model, the role of residual fluoride has a less pronounced effect on the rate of remineralisation over the time period used in this study. The enamel fluoride uptake data are supportive of this supposition. EFU was statistically significantly higher in the fluoride dentifrice group compared with the placebo dentifrice group at each timepoint, but did not significantly change across the 4-h assessment period, in contrast to %SMHR. A low level of fluoride (from 0.02 to 0.05 ppm) maintained continually in a solution surrounding the enamel for a prolonged period has been shown to enhance remineralisation ; however, such processes are diffusion limited and it is possible that the time period of this study is insufficient to resolve this effect. Future studies should explore extending this model beyond the 240-min timepoint employed in this study. In situ erosion models facilitate the control of experimental variables to explore the fundamental aspects of erosion . In the particular short-term erosion model used, we were able to precisely focus on one episode of remineralisation of a previously eroded enamel. However, this approach presents some limitations in that it misses the cumulative effects involved in the dynamic development of the erosive lesion, which would include subsequent erosive, treatment and remineralisation episodes. In addition, the protection of the specimens’ surfaces from abrasion provides a degree of artificiality since the eroded enamel is naturally vulnerable to abrasive forces caused by tooth brushing, contact with oral soft tissues, and other mechanical insults. Therefore, the results reflect the remineralising effect of fluoride following one application of dentifrice slurry on enamel eroded by dietary acid and clinical extrapolations should be carefully considered. Clinically, minimising the time elapsed between the erosive challenge and any significant remineralisation is critical to limit wear of the surface-softened lesion. Evidence from in situ studies suggests around 1 h of waiting time between drinking or eating any acidic food and brushing [31, 32]. Within the limitations of this model system, we observed that the fluoride-containing dentifrice significantly improved remineralisation of acid-softened enamel, but only starting at 60 min of intra-oral exposure. However, enamel erosion resistance and fluoride uptake were improved as early as 5 min after exposure to the dentifrice slurry. In conclusion, the results of this experimental in situ model suggest that fluoride toothpastes act rapidly (within 5 min of application) in providing protection against an acid challenge (%RER), which has important clinical implications. The authors wish to thank the study participants and site staff, as well as John Horton for his role as Statistician for GSK Consumer Healthcare during this study. Editorial assistance with the preparation of manuscript drafts was provided by Juliette Allport of Vivid Medical Communications, Ltd., Loudwater, UK and Eleanor Roberts of Beeline Science Communications, Ltd., UK, both funded by GSK Consumer Healthcare. This study was funded by GSK Consumer Healthcare (GSKCH). MN was an employee of GSKCH at the time that the study was performed. CP is a current employee of GSKCH. DTZ and ATH are employees of Indiana University School of Dentistry who have received funding from GSKCH. DTZ has received compensation from GSKCH as independent consultant in the past. The protocol was approved by the Indiana University Institutional Review Board [IRB#1410627001]. All procedures performed were in accordance with the ethical standards of the institutional research committee and with the 1964 Helsinki declaration and its later amendments.